MAGICIAN'S MAYHEM By R.S. Mollison is a charming, fun read aimed primarily at young adults. I rated it as if I was a young adult. In fact, part of the magic of the story was that it made me feel younger. I believe this was due to the way the author developed the two main characters, Tobin and Darcie. I felt that I was experiencing the story from Darcie's point of view. She was young, therefore, I was young. I even had unusual cravings for muffins, hmmm, must be magic. I read the book aloud with my husband and he got a kick out of Tobin's character, a socially awkward, wants-to-do-good-but-struggles type of young man. 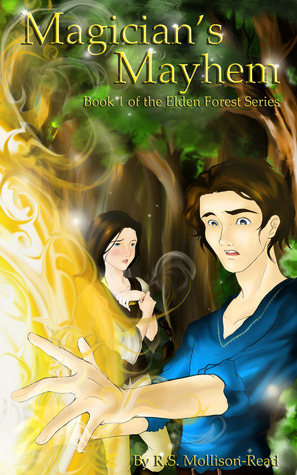 Together Tobin and Darcie go on a quest to solve the mystery of magical copper orbs that terrorize the kingdom. One orb literally explodes like a bomb in Tobin's front yard to start the story. *"He loved the cool shade of the woods, and the thousands of unique sounds; birds singing, animals rustling through the undergrowth, small streams and the swaying of branches in the light breeze. It was a symphony. He enjoyed the sunlight slanting through the trees; illuminating a single strip of the forest, with its multitude of different hues; green and brown." There was also plenty of humor scattered throughout the story to add to the enjoyment. I would certainly recommend MAGICIAN'S MAYHEM to lovers of fantasy. Sign into Goodreads to see if any of your friends have read Magician's Mayhem.